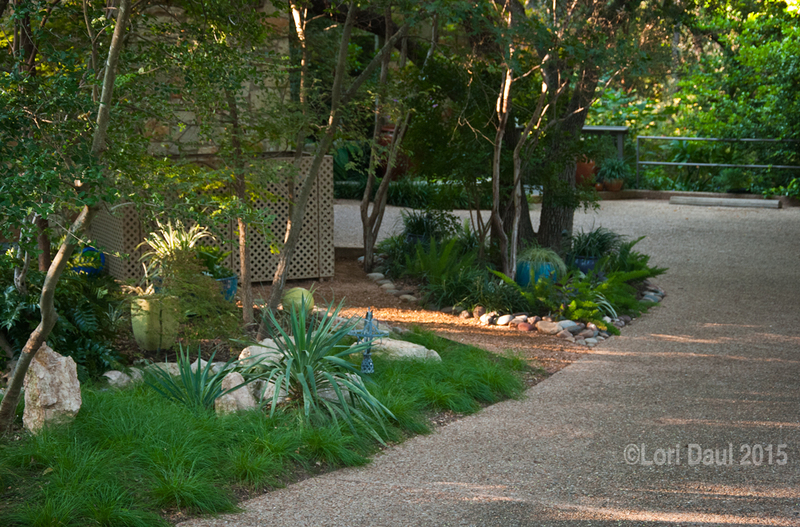 Confession time: this is the second time I’ve seen Master Gardener and garden designer Sue Nazar’s lush and shady garden on the Inside Austin Gardens Tour. I previously blogged about it here. It’s been really interesting to see what’s changed in the almost five years since she last opened her garden to the public (if you want to see even more of how Sue’s garden has evolved, check out this classic (pre-HD!) episode of Central Texas Gardener). 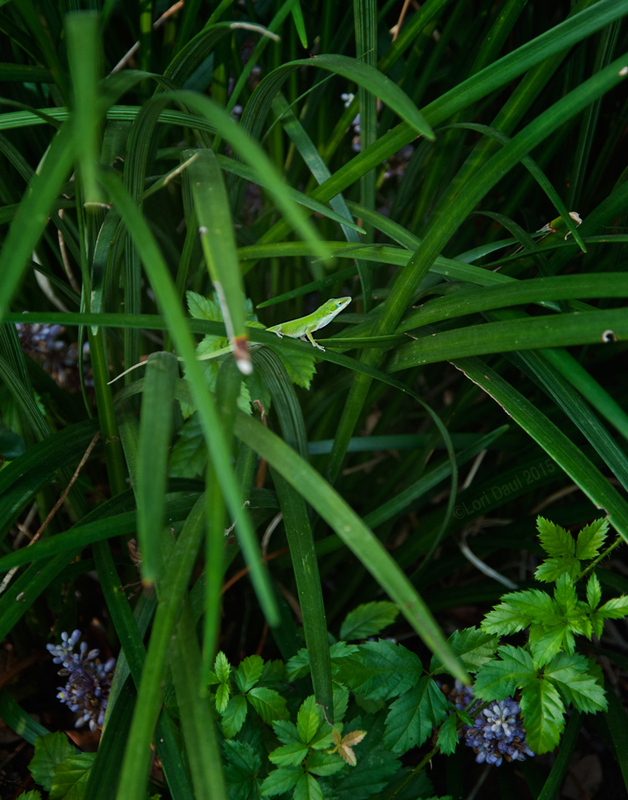 A few of the changes have been ongoing– Sue has been slowly replacing her traditional Asian jasmine groundcover with native sedges, yuccas, and other well-adapted shade plants. 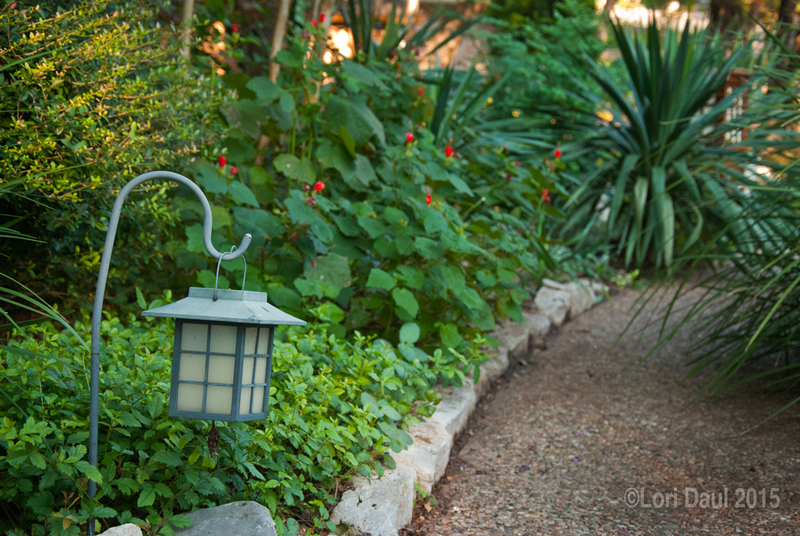 A few of the changes were more abrupt, such as the loss of a few large trees during the storms this past May, which transformed Sue’s lushly planted shade allee into a much sunnier area. Here’s a view from the driveway. It’s hard to tell from the picture, but this is a fairly steep slope. This whole area is open to deer, so the plants have been chosen with that in mind. 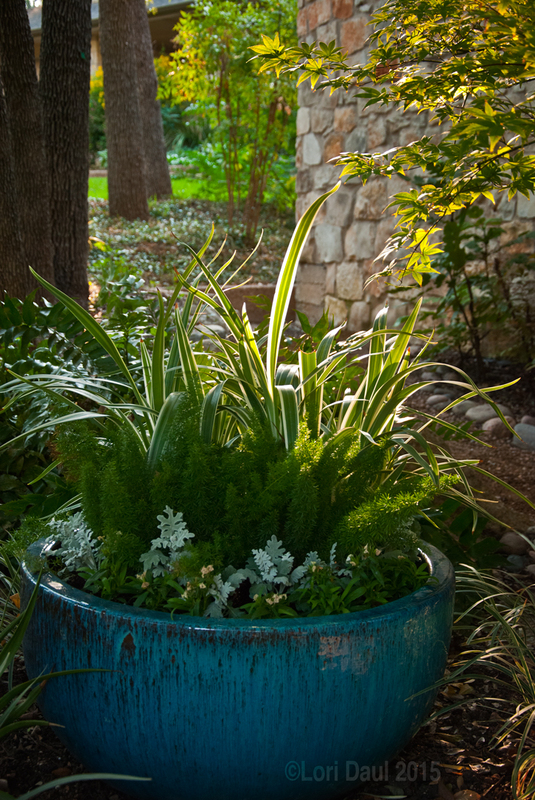 What makes this planting so successful is the high levels of contrast between the plants– soft, shaggy sedge paired with the wide strappy leaves of the yucca, the fuzzy arching arms of foxtail fern grounded by heavy blue pots and glazed ceramic spheres. 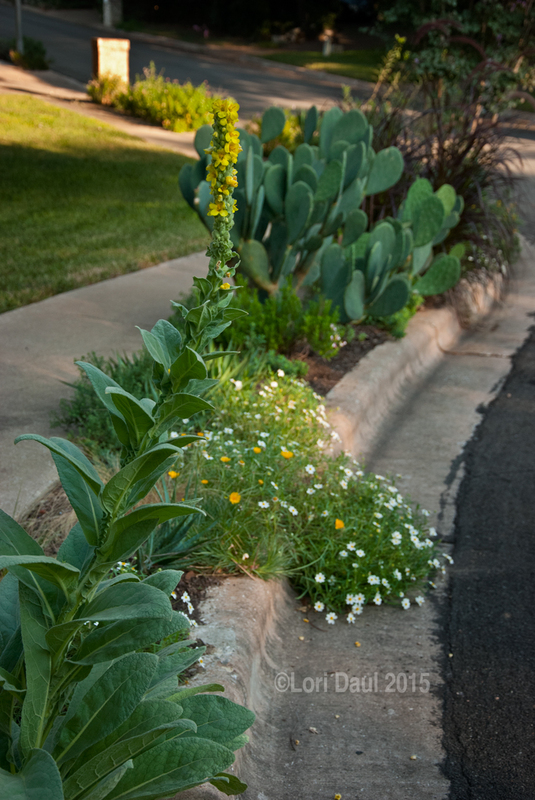 Here’s a wider shot of the curbside garden. Potted agaves add drama and height to the back of the border. I really wish I’d taken more pictures during my visit, as I am not doing this garden justice. Please check out this gallery and Sue’s profile on the Inside Austin Gardens Tour website for a more comprehensive tour of Sue’s excellent garden! 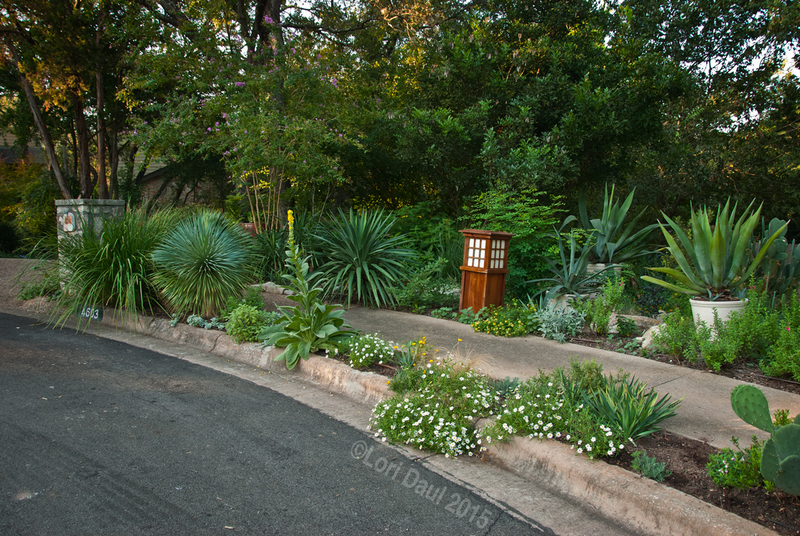 This entry was posted in Uncategorized and tagged garden tours, Inside Austin Gardens Tour, shade, Sue Nazar. Bookmark the permalink. Thank you, dear Lori, for the heads up on CTG’s first visit to Sue’s fabulous garden! We’ll be taping it again soon, I hope. And I love all your great pictures to promote this fabulous tour, including your great shots at Extension!